thinner than if you had ownership of entire horses. Ben McElroy has bought and managed a number of partnerships with great success. He has targeted partnerships in the market of pinhooking weanlings to yearlings, pinhooking yearlings to two-year-olds and in the breeding stock market. Weanlings and yearlings purchased for pinhooking partnerships have been purchased under the name Twin Peaks, while breeding stock has been purchased and sold in the name of Coronation Investments in the past years. In the first year, Coronation Investments yielded a 20% return on investment with its purchase of two mares and a weanling in January of 2010. The three were purchased for a gross sum of $315,000. Sale of the mares and their foals the subsequent November of 2010 yielded $380,000 for the partners. In 2010, Ben purchased the filly ALPHA KITTEN for $150,000 in November at Fasig-Tipton in what he read as being a very soft spot in the market for a filly that simply appeared to be a bit beneath her peak physically. The partners were well rewarded for the filly when ALPHA KITTEN sold for $405,000 at the 2011 Keeneland January Sale realizing a return on their investment of 170%. With successes annually pinhooking weanlings to yearlings, Ben McElroy has carried this success to the yearling to two-year-old market seamlessly. In 2010, Ben purchased a yearling by leading young sire TAPIT, out of the mare SAWGRASS EXPRESS for $60,000 at the Keeneland September Yearling Sale. The colt was broken and sold at Barretts in March 2011 for $340,000 realizing a 465% return on investment. 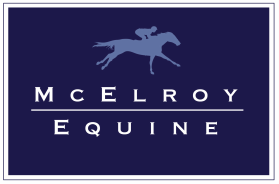 Run by Ben McElroy, Ken Donworth, and Des Ryan from Dell Ridge Farm, this partnership specializes in breeding stock. We normally buy six to eight mares at the Keeneland January Sale and sell them back at the Keeneland November Breeding Stock Sale, representing an eight month investment period. Coronation Investments has been in operation for five years and has yielded a 17-28% return each year. Specializing in yearling to two-year-olds pinhooks, 2013 was its first year in operation and yielded a 29% return for investors. Limited shares are available. A racing syndicate where we purchase nicely bred yearling fillies and race them in Europe. Successful McElroy Syndicate investments include Group Winners Long Lashes and Laughing Lashes. Racing	silks	will	alternate	-	your	silks	will	be	used! Each	racehorse	owner	will	be	billed	directly	for	their	pro-rata	share	of	expenses. Upon	dispersal	of	each	racehorse,	co-owners	will	receive timely	proceed	distributions. Each	racehorse	owner	will	have	a	Right	of	First	Refusal	for	each	undivided	interest. Contact Ben McElroy at 859-621-9763 for further information. Partnerships are continually formed with the acquisition of new bloodstock. The selection process and management are strict, giving participants the confidence to trust their bloodstock position and the enjoyment the business can offer. Please contact Ben for details about the current opportunities.